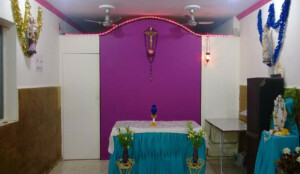 St. Joseph Parish, Sahar came into existence on 24th Aug 1988 consisting of 30 families and about 50 bachelors. It was possible only because of the sincere efforts of Rev. Fr. Vincent Parayil with the help of the KCA members. Initially only on second Sunday Qurbana was celebrated for the community. After three years regular Sunday Qurbana was offered. In 2005 because of the efforts of the members and Rev. Fr. George Kurikattil we were able to purchase a separate place for our community. Associations like Pithruvedi, Mathrusangam, Youth, Catechism are functioning actively in our parish. We celebrate the feast of St. Joseph and St Sebastian in the month of January every year in a grand manner. Our former parish priests are Fr. Vincent Parayil, Fr. Ephrem Pottamplakal, Fr. Davis Pulikottil, Fr. Dominic Mundat, Fr. Sebastian Kundukulam, Fr. Jose Chalakkal, Fr. Joseph Valliyamthadathil, Fr. Xavier Kanatt, Fr. Jose Kokkapuzha, Fr. Roy Kuriakose, Fr. George Kuttikkatil, Fr. Franklin Pottananickal, Fr. Xavier Kadaplackal, Fr. Boby Mulakkampilly, Fr. Anish Kattakayathil and Fr. Fr. Davis Chalissery. At present Rev. Fr. Zacharias Neelankavil is the parish priest. Area of the Church Property: 380 sq.ft.